Run tests within ALM Octane using the Manual Runner. When running a manual test, view the test steps and add details on the steps. 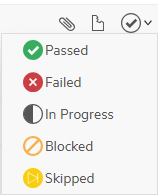 For each validation step, assign a run status. After the test run, ALM Octane creates a compiled status . When running a Gherkin test, view scenarios. For each scenario, assign a run status and assign one for the test. Note: The run statuses you assign when running manual tests (including Gherkin tests and test suites) are called native statuses. When analyzing test run results in the Dashboard or Overview tabs, ALM Octane categorizes the native statuses into the summary statuses Passed, Failed, Requires attention, Skipped, and Planned for clarity of analysis. Run manual tests or Gherkin tests from ALM Octane. Tip: You can also run manual tests using Sprinter, as described in Run and edit manual tests in Sprinter. In the Backlog or in the Quality module, select the tests to run. In the toolbar, click Run . A name for the manual run entity created when running a test. By default, the run name is the test name. Provide a different name if necessary. The product release version to which to associate the test run results and the application environment on which you run the test. By default, ALM Octane uses the last selected environments. Select Use a version from another release to run a test using a script version from a different release. If there is more than one version from the selected release, ALM Octane uses the latest version. Any tests linked to a manual test from a Add Call Step use the same specified version. Select Draft run if you are still designing the test but want to run existing steps. After the run is complete, ALM Octane ignores the results. Click Let's Run! to run the tests. Tip: During the test run, click the Run Details button to add run details. Where relevant, assign statuses to the steps. The status of the test is automatically updated according to the status you assigned the steps. You can override this status manually. If you encounter problems when running a test, open defects or link existing defects. In the Manual Runner toolbar, click the Test Defects button . If you want to associate the defect with a specific step, next to the step, click the Add Defect button . In the Add run step defect dialog box, fill in the relevant details for the defect and click Add. The new defect form is automatically populated with the application module of the test where the run originated, as well as the release that was chosen to run the test. Other relevant fields are filled as well. To link the run to an existing defect, click Link to defect, select the relevant defect(s), and click Select. Click to view a list of the defects for this run. To copy test run steps to the defect's Description field, click Copy steps to description. This helps you reproduce the problem when handling the defect. In a manual test, if the defect is connected to a run, all the run's steps are copied. If the defect is connected to a run step, the steps preceding the failed step are copied. If there are parameters in the test, only the relevant iteration is copied. In a Gherkin test, the relevant scenario is copied. It is sometimes useful to attach documentation to the run. To attach to a test run: In the toolbar, click the Run Attachments button . In the dialog, attach the necessary files. Tip: Drag and drop from a folder or paste an image into the Manual Runner. After performing all steps, at the bottom of the ALM Octane Manual Runner window, click . Note: If you have not marked all steps or validation steps, the run status is still listed as In Progress. Finish entering and updating step details to change the status. In the Runs tab of the test, click the link for your specific manual run and view the results in the Report tab. The report displays step-by-step results, including the result of all validation steps, and any attachments included in the run. You can also see which phase the test was in when the run was created. Tip: To view test phase information for multiple runs, add the Test Phase column to the Runs tab.